You know you can trust a name like Chase to stand behind your card with leading edge security and outstanding customer service. 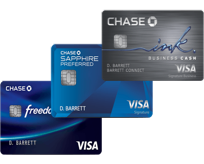 Chase offers a wide range of choices in credit cards including: VISA® or MasterCard®, rewards credit cards, cash back credit cards, low introductory APR credit cards, no annual fee credit cards, balance transfer credit cards, travel credit cards, business credit cards and student credit cards. Here are some featured cards from Credit Karma’s partner, Chase.